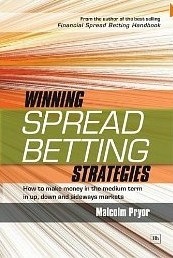 Winning Spread Betting Strategies is about constructing winning strategies covering all types of market, up down and sideways. Key ingredients for each strategy include overall market direction, entry and exit techniques and bet size determination. The strategies are used on a wide range of instruments, including stocks commodities and currencies, and trade duration tends to be weeks. Examples of each strategy are fully illustrated with charts and commentary, there are over 150 charts in this book, taking the reader step by step through strategy implementation.